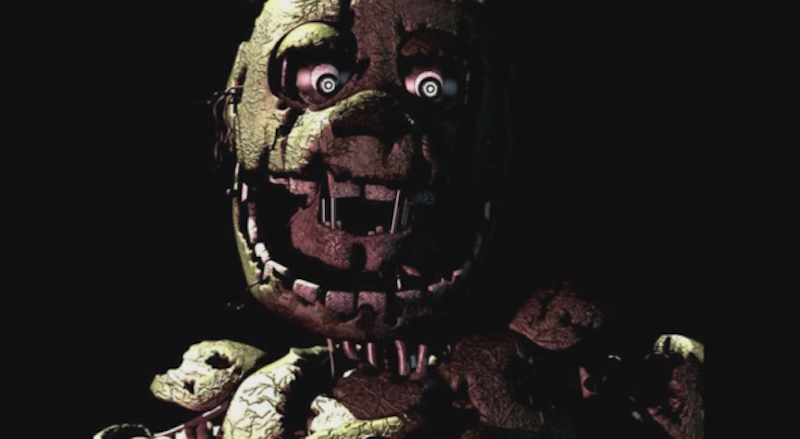 The Hollywood Reporter reports (Hollywoodly) that Freddy Fazbear and his horrifying animatronic pals are headed to the big screen. Warner Bros is heading up the production. It will be produced by Roy Lee of Vertigo Entertainment (Run All Night, The Ring, The Grudge), along with Seth Grahame-Smith and David Katzenberg of KatzSmith Productions (both of whom are working on a Beetlejuice sequel). They’ve put the project out to writers. So that’s... unexpected. Except it’s really not. Five Nights at Freddy’s has gone from a Steam Greenlight mad science experiment to a nationwide sensation with a million-billion clones. Of course a major movie studio would latch onto what could maybe possibly potentially be its next horror mega-hit. And hey, lots of people watch other people play the game on YouTube anyway. Maybe this will just be a Let’s Play with ungodly high production values. Then again, video game movies are famously good at ending up in Hollywood purgatory, which is often functionally equivalent to Hollywood hell. I suppose we’ll just have to wait and see. Probably double-check that your lights are working.